All this is, I suppose, a long-winded way of saying that if you’ve been looking for the American version of Slugdge… well, Of Rot and Ruin has got you covered, bro. Now, as snarky as that previous sentence might have come across, it’s not necessarily a bad thing by any means. After all, Slugdge are one of the modern Metal underground’s most respected and beloved bands, so anyone who sounds like them, whether by accident or by design, is probably onto a good thing either way. But the rather excessive praise this album has been receiving in certain corners of the internet seems to come either from an honest lack of knowledge about the works of Moss and Pearson or from the deliberate decision to ignore their existence in favour of hyping up a “home-grown” equivalent. Once you get past the obvious sonic similarities between the two groups, however, it should quickly become obvious that Hath have more than enough to offer on their own terms… although calling Of Rot and Ruin “a masterpiece” (as I’ve seen elsewhere) might be stretching the truth a little bit. The album certainly starts off on the right foot, as the opening triptych of “Usurpation”, “Currents”, and “Rituals” showcases only the very best aspects of the band’s sound – hyper-intense drum work, meaty, rumbling bass lines, bold, weighty riffs, and moodily melodic lead lines, all arranged in an impressively punchy, artfully proggy, manner, and topped off with some seriously aggressive (and occasionally surprisingly adventurous) vocals – over the course of twenty tumultuous minutes. 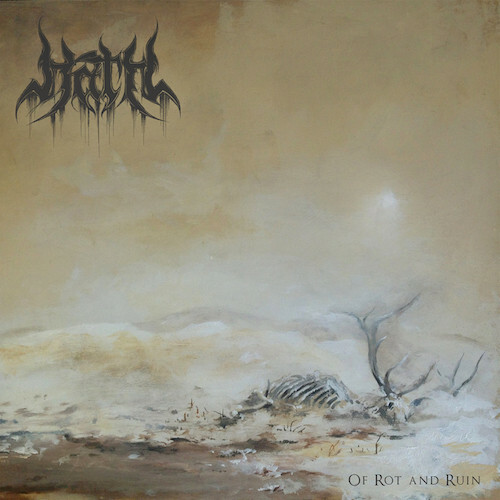 This run of killer quality continues through the doubly-deathly “To Atone” and the brooding “Withered”, and while it’s relatively easy to play “spot the influence” still – a dash of Nevermore here, a bit of Cattle Decapitation there, and a whole heaping of Opeth (especially on the latter two tracks) – the quartet consistently do such a damn fine job of putting their own signature stamp on things that these comparisons quickly become more about recognising the incredibly high quality of their music than an attempt to paint the band into a creative corner. As undeniably strong (and utterly joyous to listen to) as the first half of the record is, however, I have to admit I have some issues with the second half of the album. For one thing, the band’s Opeth-ian ambitions get a little bit too blatant on “Worlds Within” and “Kindling”, as while the former is still a pretty great track, the latter really does just sound like a discarded Blackwater Park instrumental interlude that had been left on the cutting room floor. Nor does it help that the band’s attempt to progress and/or diversify things even further on “Accursed” end up sounding like an almost entirely different band, while also owing a rather blatant debt to modern Insomnium, and the combination of these various factors inevitably makes the back half of the record feel a lot more disjointed than the front. That being said, even here Hath continue to put in some good work, as the impressive intensity and much more distinctive delivery during the much-improved second half of “Accursed” leads seamlessly into captivating closer “Progeny”, which successfully recaptures both the electrifying energy and songwriting panache of the album’s early tracks to end things on a real high note. In the end, while the hype machine might be trying to tell you one thing, a more objective analysis of this album will probably tell you something quite different (and ultimately more accurate). For me this means that, despite its flaws (which far too many writers have been willing to overlook or ignore in my opinion), Of Rot and Ruin remains an extremely promising full-length debut from a band who have all the tools, and all the potential, to make some major waves in the growing Progressive Death Metal scene. 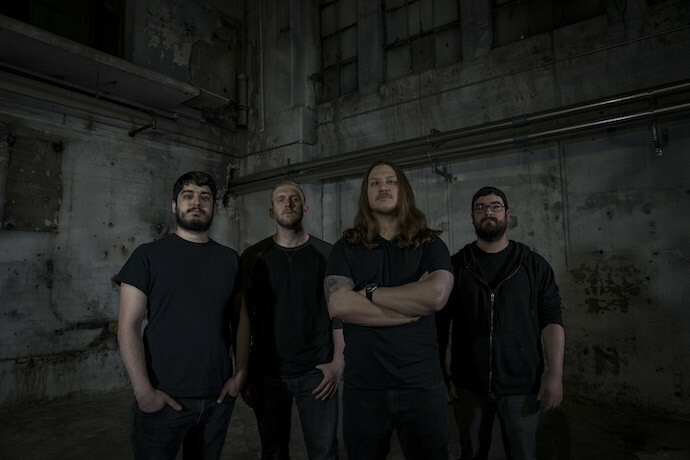 So if you’re a fan of bands like the aforementioned Slugdge, Allegaeon (whose new album we’ll also be reviewing very soon), and underappreciated Prog-Death icons Iron Thrones (remember them?) then you should definitely carve out some time to listen to this one if you can, if only so you can say that you were into these guys before they got big! I honestly don’t understand the claim of this being like Slugdge. Aside from being on the same label I see very little similarities. Well, they do have clean vocals sometimes. Opeth – yes big time especially on the tracks mentioned but this review makes it sound like this is some Slugdge ripoff which is laughable. I’m with Joe. I love Slugdge, but this album has a very different feel. Sure, they’re both death metal. They both have guitars, bass, drums, singing, and screaming. In that sense, sure. They’re very similar. Both albums invoke different emotions, song writing structures are different, and solo styles are different. I feel like the interpretation in this article is just lazily scratching the surface and focusing more on comparing Hath to other bands. I can’t imagine putting years into making something just to have someone devote paragraphs to talking about who they think of when they hear your work. Slugdge made songs about Bloodborne, these songs are about Dark Souls.. HUGE DIFFERENCE! Hath isn’t as riff centric as Slugdge and they don’t have as much melo-death in them. I kind of get the comparison, but not really.